Last week was busy in terms of new car debuts, so we thought we’d put them all together and see which one you think will do best in their respective segments. Sales of premium compact cars Europe are back to their 2015 volume after peaking at almost 940.000 units in 2016. With nearly 874.000 sales in 2017, the segment accounts for 5,6% of the total European car market, down from 6,1% the year before. The average age of the models in this segment is relatively high which explains some of the decline. The top-10 models ranking is exactly the same as 2016 but there have been some individual fluctuations and we have a new leader in the brands ranking. Audi still holds the top spot with the A3, but its 14% loss means a 1,5 percentage point of lost share as its rivals are closing in. The Mercedes-Benz A-Class is pretty stable for a model that will be renewed in 2018 and stays ahead of the BMW 1-series as both models add more than a full percentage point of share. As a result, this top-3 increases its share of the segment to 51% and they are the only nameplates with 6-figure sales. The BMW 2-Series Active and Gran Tourer MPVs are down 15% as they’re being updated early 2018, but at least they remain well ahead of the Mercedes-Benz B-Class, whose next generation will also include a 7-seater option. In fifth place, Volvo is best of the rest as usual in the premium segments in Europe, with the V40 pretty stable at -6%. The premium compact car segment in Europe loses volume for the third consecutive quarter in Q3 of 2017, with an 8% decline in sales. Year-to-date, the segment is down by 6% to nearly 671.000 sales. The ranking is relatively stable, but some individual models still show significant volume decreases or increases. The dominant segment leader Audi A3 is down 6% in the third quarter and its closest two rivals are closing in. The 2nd placed Mercedes-Benz A-Class improved 3% while the BMW 1-series saw stable sales in Q3. All three models have sold over 100.000 units so far this year and combined they control more than half of the segment. However, that does not paint the full picture, as Audi sells its hatchback, sedan and convertible models all under the A3 monicker, while Mercedes-Benz and BMW have split off some of those versions under different names. Mercedes-Benz is the segment leader in terms of brand sales, with the A-Class hatchback, B-Class MPV and CLA sedan and station wagon at 210.606 sales, stable on the year before. BMW follows closely with 205.950 sales of its 1-Series hatchback, 2-Series MPV and 2-series Coupe & Convertible as well as the i3 EV, down 2%. Growth has stalled in the premium compact car segment in Europe, as the segment is down 8% in Q2 of 2017, leading to a 5% loss in the first half of the year to 468.243 sales. The ranking is relatively stable, but some individual models still show significant volume decreases or increases. The dominant segment leader Audi A3 is down 15% in the second quarter and sold just 4.500 cars more than the #2 Mercedes-Benz A-Class. The A-Class has enjoyed increasing interest from buyers, as it was one of the fastest growing models in the segment in 2016 and continues to gain share in 2017. It distances the BMW 1-series for which the facelift effect already appears to be wearing off. Sales were stable in Q2 reducing the first half gain to 8%. The next generation 1-Series will become more of a follower than an individualist, losing its rear wheel drive platform and the 6-cylinder engine option, as well as its somewhat controversial styling in favor of more vanilla styling and mechanics. Undoubtedly that will only help it increase sales further and to become a real challenger for the segment lead. After outgrowing the overall market in 2016, the premium compact car segment in Europe appears to plateau in the first quarter of 2017 with sales down 1% in a market that continues to grow (+7,8%). The dominant segment leader is in trouble, as the Audi A3 loses 12% of its volume in the same period last year, while its nearest rivals continue to grow. The A3’s top spot is not yet in jeopardy, as the model still has an 11.000-unit advantage over its nearest rival, but its share of the segment has dipped to an all-time low of 20%. The Mercedes-Benz A-Class holds on to 2nd place by the skin of its teeth, as the BMW 1-series grows 16% to come within 300 sales of the A-Class. It will be interesting to see how the next generation 1-Series will perform when it gets front-wheel drive and loses the 6-cylinder option, making the current generation the last hatchback in its segment with those two features which are so important to enthusiasts but much less so for the average buyer. It will trade those qualities for more generic styling and more interior room. In an overall market up 6,2%, the premium compact car segment in Europe grows 8% in 2016, to top 900.000 annual sales for the first time ever. Growth slowed down a bit in the last quarter, when the segment grew by just 2%. Segment leader Audi A3 sees its sales fall by 4%, but still comfortably leads the segment if we’d only look at nameplates. This is relevant to mention, because Audi only has one nameplate in this segment, under which it sells four different bodystyles: 3-door and 5-door hatchbacks, a sedan and a convertible. Its main rivals have at least 3 different nameplates each in this segment, and if we’d look at total brand volume, Mercedes-Benz would be ahead of BMW by the tiniest of margins (281.348 vs 281.249), both selling Audi by more than 90.000 sales. 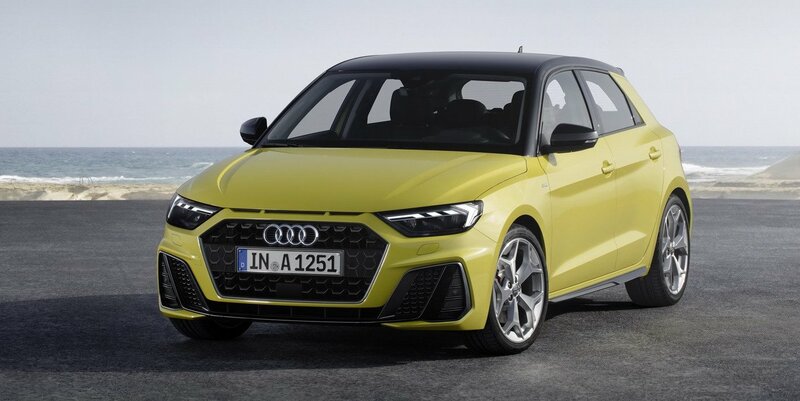 Then again, Audi also has a smaller model, as you’ll see below, and this A1 coincidentally sells enough units to put Audi back on top by just 5.000 sales (286.532 units). Sales of premium compact cars grow slightly faster than the overall market in the first three quarters of 2016 at +9% vs. +7,5% and at more than double the growth rate of the mainstream compact car segment at +4%. Only four of the 14 models lose volume, among which the dominant leader Audi A3, down 4% but still almost as untouchable as its platform sibling VW Golf is in the mainstream segment. However, as I explain every quarter, Audi isn’t really as dominant as the ranking suggests. Mercedes-Benz is the real leader of the segment, with a 30,1% share (down from 30,6% in 2015) from its three models, followed by BMW with a 29,6% share (up from 29%) from its 4 models, while Audi only has a 20,7% share with its single model (down from 23,6%). Since the latter is unlikely to introduce a luxury MPV based on the Touran or Sportsvan, Audi will have to make do with just the 3- and 5-door hatchback, sedan and convertible versions of the A3. The premium compact car segment grows faster than the overall market in the first half of 2016 at +10% vs. +8,8% and especially compared to the mainstream compact car segment at +6%. The German brands increase their dominance of the segment with over 83% share, and are competing fiercer than ever to attract younger, mostly first-time luxury buyers so they can try and keep them faithful to their brand when they move up the ladder. The model-ranking leader Audi A3 loses 3% of its volume as the competition heats up, but BMW becomes the biggest brand ahead of Mercedes-Benz. The 1-series hatchback, 2-series MPV, Coupe and Convertible and the i3 electric car add up to a combined 145.000 sales, compared to 144.000 sales for the A-Class hatchback, B-Class MPV and CLA sedan and station wagon. Despite having the A3 hatchback, sedan and convertible at the top of the ranking, Audi is a distant third with “just” 104.500 sales in the first half. Sales of premium compact cars in Europe grew faster than the overall market in Q1 of 2016, at +10%. The long-standing leader of the segment, the Audi A3, stays firmly in control despite flat sales and therefore a diminished share. Bear in mind Audi sells all versions under the same name: three-door, five-door, sedan and convertible, while its main rivals use different names to differentiate the body types. At brand level, Mercedes-Benz remains the best seller of compact luxury cars with its four vehicles under three nameplates: the Mercedes-Benz A-Class adds 19% to its volume thanks to its facelift and moves past the also facelifted BMW 1-Series for the #2 spot. The 1-series has flat sales, but the Bavarian brand still is the fastest growing brand in the segment thanks to the 61% increase of the BMW 2-series Active/Gran Tourer, which beat the Mercedes-Benz fairly and squarely to become the best selling premium MPV.